It's undoubtedly a good thing when Nintendo starts releasing older titles on the eShop that are otherwise fairly difficult to find or play. 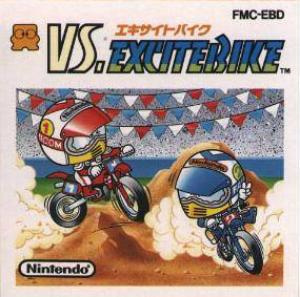 But does VS. Excitebike, originally only released on the Famicom Disk System in Japan in 1988, offer enough extra content compared to the original to justify a purchase? As the core of the game is left intact, it depends on how much you would enjoy being able to save rudimentary custom tracks and race against your friends. VS. Excitebike offers three modes: Original Excite, VS Excite, and VS Edit. 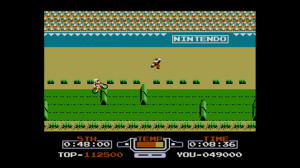 The first is simply the main mode offered in the original arcade game – you are able to compete in races against the computer. VS Excite allows you to play against one friend locally on the same screen, and VS Edit allows you to create up to four custom tracks which you can use to play against your friends. Notably absent from the original game, you can save your tracks in this game. "Original Excite" has you compete in seven different races against computer opponents. However, first you must qualify for each race, which means you need to beat a time for each track solo before you're allowed to race actual CPU opponents. This can quickly become tedious, as when you fail a race you'll need to complete the qualifier again...and again...and again. That's because the races against computer opponents are tough. You don't actually compete for individual places; instead, despite racing against many other CPU opponents, your finishing time determines your place. Each race has a time requirement in order to place 5th, which is the minimal requirement to be able to move onto the next race. All but the most proficient Excitebikers will likely fail many, many times, which means you'll have to play those qualifiers quite a few times. This wouldn't be so bad if the qualifiers actually helped you improve at a track, but they don't. You might learn the obstacles better, but the real challenge is avoiding the other bikers, and you don't get to practice that in the qualifier. 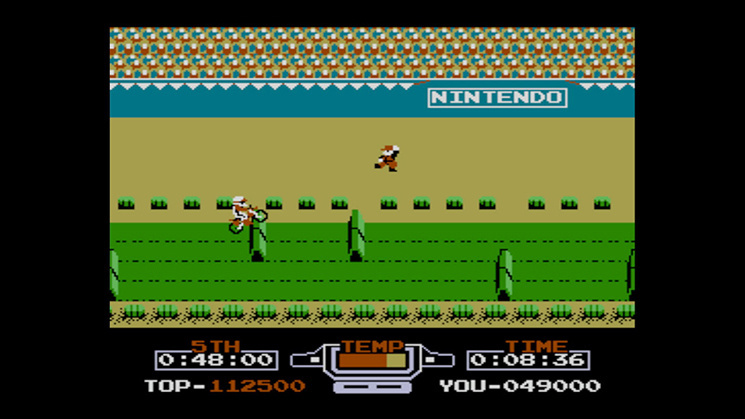 It can be very difficult to avoid the seemingly random movements of the CPU riders in actual races, something which will likely cause the player great frustration. Ultimately, difficulty is a subjective matter; we should still emphasize that the core gameplay is still enjoyalbe. This version of the game features fitting music during gameplay, which is a welcome addition - though if the difficulty is troubling you then repetition will be something to deal with. Again, the required qualifier structure dampens the experience. VS. Excitebike also features a multiplayer mode which lets you race against a friend locally. You can choose from three prearranged tracks, or you can compete using a track created in the editor. Whichever you choose, the screen shows each player's perspective on the course as well as an overall progress bar at the top so that you can gauge how far ahead or behind you are in comparison to your opponent. It's a neat mode that will likely provide some of the greatest enjoyment in the game, providing you have a friend to play with in your area. You have two modes to select from in multiplayer: Battle or Free. Battle mode involves trying to lap your opponent, which you can help set in motion by running into them and temporarily wrecking their bike. Free mode makes it so you can't wreck each other's bikes, and involves just racing to reach the finish line. In both options you can choose the number of laps and rounds for the track you've selected. The third mode is an improved track editor for the VS tracks. The level editor in the original Excitebike for the NES was a mess. It was a neat feature for its time, but a convoluted selection system made it tough to tell which track element you were using, and you couldn't save the tracks. The latter problem is particularly notable; who wants to put a lot of time into designing a neat track if you can't even save it? The editor in VS. Excitebike is much improved in every way, though not without its limitations. You can select icons of the 20 different track elements that you'd like to use and insert them into your custom track with ease. Each track has a finite length, which seems like a missed opportunity for some particularly interesting courses, but it's important to keep in mind that this game is 27 years old – you're not going to find a Super Mario Maker level of detail here. However, you can save up to four custom track designs, which is a welcome addition in comparison to the original game. The game features a somewhat confusing "disk" system for duplicating tracks. VS. Excitebike allows you to take a custom track that you'd like to recreate and modify and copy it onto a different save slot. Strangely, it uses a "Your disk condition" category to indicate tracks that are prearranged and tracks that you've made, and a "Set a loading disk" category to duplicate tracks and move them into the proper area. Once you figure it out it's simple, and is a legacy of this being a simple ROM conversion from that original disk system, without any updated clarifying localisation. The original NES Excitebike was a simple yet amazing game for its time, and it remains fun to this day. VS. Excitebike provides a novel way for those outside Japan to experience the core experience along with some interesting additions, even if it has some shortcomings. It's still a fun game, but it serves more as an enjoyable interlude between playing other games than a fully-fledged experience in and of itself. SHould have added the ability to share levels Nintendo. Put a little effort into these VC releases that call for it. @XCWarrior how easy would level share be for a near 30 year old game programmed on archaic hardware. I always see these comments of they should do this well how would you do it? The moral of the story; Just because a game was previously Japan-only, doesn't mean it's anything worth writing home about. How's about a brand new Exitebike? And bring back Wave Race while you're at it. @DarthNocturnal They made a pretty great excite bike for the wii (world rally) but unfortunately not many people bought it. I've bought a couple NES games on the VC but for the most part $4.99 is way to expensive. PS1 games are only $5.99 for the most part on the playstation store with PS2 games at $9.99, now that's a fair price. If Nintendo lowered their prices, more people would buy these games and more people would be happy with the VC, everyone would win. Sidebar, excite bike world rally is sweet! I played it online all the time! @Mrclaycoat I prefer NES games to both PS1 and PS2 games so that doesn't like a bad price at all compared. @Mrclaycoat well at least we get free online. The price doesn't bother me usually but I must admit a few games on the vc realy should be no more than 1.99. @dumedum for me it depends on the game and of course to each their own. Many NES games are truly timeless and untouchable since my childhood but most of them aren't available currently. True some gems are there are also garbage games like Vollyball and Urban Champion which at $4.99 is insane in my humble opinion. @faint I have a PS3 which is free online as well The Wii U is my only current gen system and I do love it to pieces. @Mrclaycoat I honestly would love a cross buy subscription service for nes, snes, gb and gb color games. You pay a flat fee and your guaranteed x number of vc titles for your wiiu/3ds a month. I had forgot how much I like this version more than the standard NES one. So glad it was released outside of Japan...hoping for more VS. games to appear on the VC. @faint I'd never leave the house again if that happened! @DarthNocturnal I don't suggest deciding whether it's something to write home about based on one review or the fact it was japan only. I like this version quite a bit myself. I prefer the best out of 5 of Vs. to the best out of 3 system of the NES version and the complete times for the stages actually seem to be more lenient in some cases in Vs. 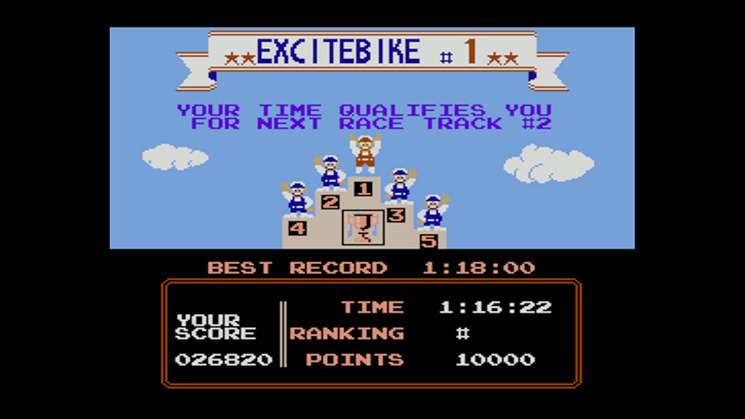 It's also worth mentioning that selection B of the original Excitebike is just as tricky with the computer AI as Vs. Excitebike. Not to mention that the arcade Vs. Excitebike used to be fairly common in the US and is very similar to the main 1p mode of this version. Finally, a local multiplayer. 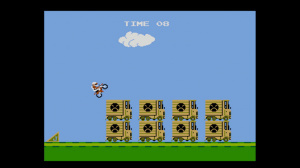 The excitebike from wiiware sorely missed this. If you've never played (or even heard of) this one, you have my sympathy. 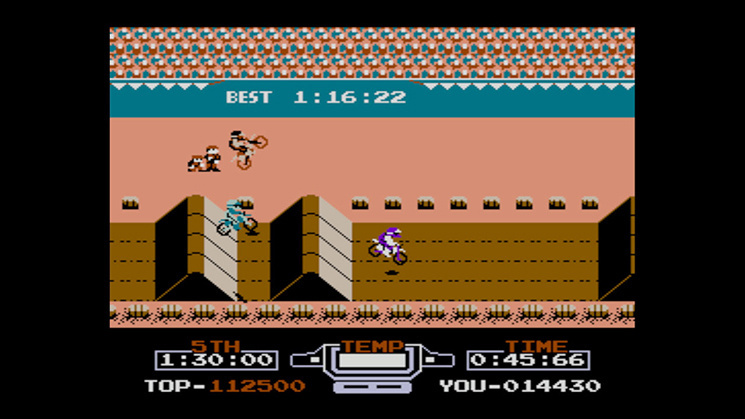 I decided it wasn't worth writing home about by playing the NES Excitebike. This version doesn't add a whole lot that seems worth it, and it's first version wasn't exactly the most engrossing game either. About 20 years too late! @DarthNocturnal What if they brought back both of them at the same time by combining them? You ride a jet ski... tied to a motorcycle... and you race them... and at any given moment, you detach and land on the ground. I call it... ExciteBeached. @ManateeBlubber Some dude made a heavily modified motocross bike with ski attachments and a rear wheel with padle shaped grooves that provided thrust on land or water. Dude rode his bike across the water. It was epic! @faint They rebuild these games with each having their own emulator. WHy not take a little extra time and add something to it? But as I stated somewhere else, I would have rather they just updated World Rally from the WiiWare shop. @DarthNocturnal Why did you have to say that? Now I want a Waverace/Excitebike crossover I'm never going to get. 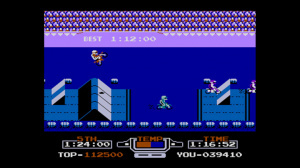 Excitebike for NES was the very first game I ever played and I never got to play the disk version so I think I will actually be picking this one up. It's cool to see Nintendo releasing games on the eshop that didn't exist outside of Japan lately, especially Earthbound Beginnings. A nice bonus would have been if they also tacked on "Excitebike: Bun Bun Mario Battle Stadium" with this release as well, but I can definitely understand why they didn't. @faint not to mention the fact so many people don't realize how few people actually buy some of these vc for some of this stuff.